20120828 - Hurricane Isaac Arrives! Hurricane Isaac has started to make himself known! By 4pm today, Lakefront Airport was deserted, gates all locked, buildings and airplane hangars shut tight. The two of us from On Wings Of Care here at the airport business Flightline First are the only humans left here, with our faithful dogs and our trusty On Wings Of Careairplane "Bessie" and several other airplanes huddled together inside this huge, sturdy hangar. The airplanes all have heavy-duty trash bags tied around their wheels for the possible intrusion of standing salt water. We'll stay here through the storm, mostly because if we leave, we'll never get back in! The airport is on the "wrong" side of the levee, and what Lake Pontchartrain experiences, we experience here, for the highest point here is only 10' above sea level. Read more: 20120828 - Hurricane Isaac Arrives! By now it's been all over the news and blogs, and the reports cover all extremes. The beginning of the Apocalypse to some, citing 1.5 million barrels of butane present in the apparently collapsing salt domes under this rural area of southwestern Louisiana. A small event involving only the loss of a few trees to others. After flying over this sinkhole, and smelling the foul air for just 15 minutes, we can testify that it's definitely not the minor concern of a few trees lost. We'll restrict ourselves here to providing you with photos and videos from today, but refer you to the web where you'll find photos from two, five, and more days ago -- and see for yourself how fast the trees are sinking and disappearing, and how much larger the hole is becoming! Update Monday August 6: We have full confirmation now that SCARLETT is NOT among the surviving dogs confiscated from the Spindletop ranch last July 17. We don't know where she is nor whether she is dead or alive. But we'll keep looking. If any of you readers have any information or leads or suggestions, we'd love to receive them. Just email us at info@OnWingsOfCare. Thanks for your support. Wherever you are, Scarlett, be at peace and know we love you. UPDATE Sunday August 5 -- our match for ACE was just confirmed! The AFF people finally found his microchip. He's going home next week! YEA!!! A SECOND UPDATE Sunday August 5 -- they have also confirmed our match for FAWN! She goes home next week, too! Dog rescuers from all over the country were startled, outraged, and grieved by news on July 17, 2012 that the Spindletop Pitbull Refuge in Willis, TX was in reality no refuge at all. Montgomery County, after receiving a tip, descended on Spindletop and confiscated close to 300 dogs that had been kept in crates, many sitting in their own feces and urine. At least one owner-identified dog was recently discovered to have escaped during the raid only to be hit and killed by a car. A mass grave was discovered filled with bodies of 38 dogs who had died this past June from thirst, overheating, and lack of fresh air in one of the unventilated buildings used by Spindletop. It started out with an innocent email from a desperate cat rescuer in Louisville, Kentucky (KY). Could we help her find homes and transport for her nine rescue cats, because her own health was failing and she could no longer provide for them? All we could tell her was that we would network all we could, and we would help with transport somehow if we could. So we called and emailed the usual angels, and the usual angels came through! Chief among them -- Lynea Lattanzio of Cat House on the Kings. Lynea can always be counted on for a reality check. "You want to bring nine unadoptable cats out to central California where we are overloaded with unadoptable cats??" Not quite what we wanted to hear. But hey, she did reply and she didn't say "NO!" So we were encouraged. Then two other cat rescuers from California also replied, and between the three of them and us, we thought we might be able to help with five of the cats in need, if they were actually adoptable or could become so. In rescue work, nothing is ever simple except when it happens by accident. This venture was going to take a lot of planning, which meant it would be far from simple. But it was full of serendipity, from start to finish. The first amazing coincidence came two days after that email cry for help with the nine cats: a good friend of ours had just purchased a twin-engine plane from Nashville, Tennessee (TN) and could we help get it back to southern California for him? Well, Nashville is only a three-hour drive from Louisville! I asked if he would mind if we brought a few well-behaved passengers with us (ahem), and he said that would probably be fine! Okay, then, we had a way to get these rescue cats back to California, all we would have to do is get the cats the rest of the way to their rescues within California and then get ourselves back to New Orleans from California. The plane was so roomy and powerful that we could have taken a hundred cats, especially if we removed some of its many seats and put them in one of the many outside cargo bins. It was going to be a no-brainer, there would be so much room in there it would be a waste! Apparently the universe thought it would be a waste of space, too. (Does Nature really abhor a vacuum?) Because another two days later there came an email from someone who knew someone else for whom we had flown some young goats to California. These folks were desperate to get five young goats from the Knoxville, Tennessee area to California before July 18, and the logistics of getting all five of them on commercial flights had become too difficult. Remembering the small size and ease of transporting those other young goats, we said "Sure! No problem!" Read the article and see the photos here! Today we went searching for whale sharks again, to help a team of scientists who were ready and eager to place some satellite tags. With serious thunderstorms to the west and east, their target area was south of New Orleans, beyond Sackett Bank and on toward the Mars and Ursa platforms and an area known as the "Mississippi Canyon." (Recall the oil we documented in that vicinity last April 12 and18.) Some whale shark sightings had been reported in that vicinity by fishermen during the preceding week, so we were hopeful, even though this area was well east of the Ewing Bank area where we had seen a group of whale sharks on June 29. We did a very careful search of this area for several hours, but we found nothing! Nada. Nobody. Not even flying fish! It seemed a desert. No sooner were we out of radio communication range with the boat than we spotted some fins and spouts! Three sperm whales! Looked like maybe a mother and calf, with a larger male some ways away. The mother and calf were just hanging there vertically, as if perhaps they were recovering from a long dive. This behavior continued for a good ten minutes, after which we continued on our way to search for whale sharks. No whale sharks, but we did find hammerhead sharks, and we were treated to several schools of golden rays. And some interesting research-survey ships, mobile offshore drilling units, and salvage vessels of sorts we have not seen before! Story of Pellie Lou - Available for Order or Pick-Up NOW! We are thrilled to present to you the book many of you have been waiting for! Available in lovely semi-hard cover paperback now, printed and bound in New Orleans. A children's story (for adults, too) based on real events, places, people, and wildlife in the Gulf of Mexico, about a pelican who survived the oil pollution disaster of 2010. Includes 46 color photos taken by us and local friends here in the Gulf since the summer of 2010. Nice 6" x 9" size, about 90 pages. Or buy this book from Amazon.com, anywhere in the world, here! $22 per book for five (5) or more copies. These prices include sales tax in Louisiana for those of you who receive it there. Electronic copies are $10 each, and they will arrive promptly in your email as a password-protected pdf file (and of course we'll give you the password!). Pay by check (to On Wings Of Care, Inc. with a note that it is a book order for Pellie Lou) or by credit card or PayPal here or by clicking on the "Donate" button on the upper left side of any page of OnWingsOfCare.org. For orders of multiple books, please add $2.50 per book for shipping and handling. If we can do it for less, we'll advise you and either return any difference over $2 or send you a receipt for that difference as being a tax-deductible donation to On Wings Of Care, whichever you prefer. 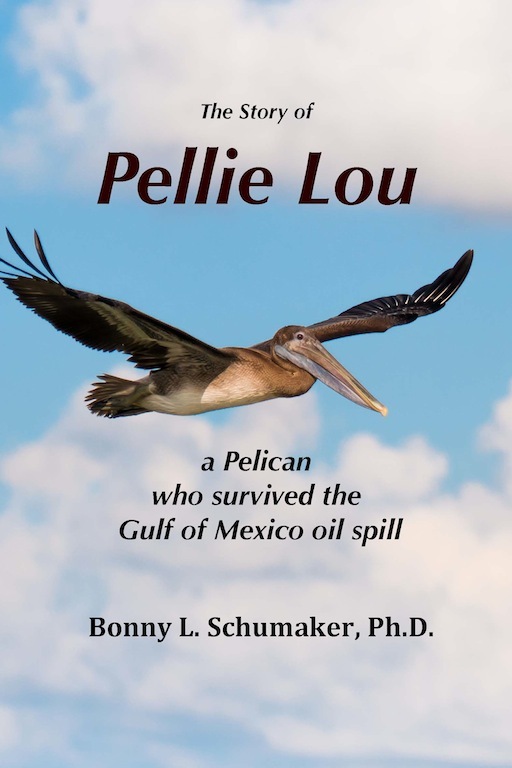 Sorry, but the law will not permit your purchase of the book itself to be considered a tax-deductible donation to On Wings Of Care, even though all profits from the sale of Pellie Lou will be used solely for OWOC's non-profit work to benefit the Gulf of Mexico. Read more: Story of Pellie Lou - Available for Order or Pick-Up NOW! 20120708 - Homeless Mom & Pups Homeless No More! San Bernardino County, California. Most famous among animals rescuers for having the highest-kill animal "shelters" (NOT!) around. Every day a hundred or more new animals come in, and about that many seem to be killed every night. There are tireless angels of rescue who are there every day, pulling animals from death at the last minute, thanks to offers of $20 here and $15 there to put them in boarding somewhere to give these animals another day or two to be rescued. They faithfully send out emails to hundreds of other rescuers every day, with photos and descriptions of the dogs and sometimes also cats, horses, bunnies, and other animals whose brief period of "help" has ended. These emails are heart-wrenching, because the animals in those photos are beautiful, some young and highly adoptable, some senior and mellow and just as pleasant and well-behaved as can be. Their eyes show that they know the horror that surrounds and awaits them. We look at these emails, we try to select animals that we think are excellent candidates for people and other rescue organizations we know, and we network them with all our might, just like so many other rescues do. On some occasions when we can, we pull the animals and foster or place them ourselves. But we are the proverbial drop in the bucket. Leave it for another note to describe some solutions we have pondered long and are acting upon. This story is to show you that some animals DO get out of these places, and happily-ever-afters really do happen. This email came around with "URGENT URGENT PLEASE HELP" all over it in bold red capital letters. 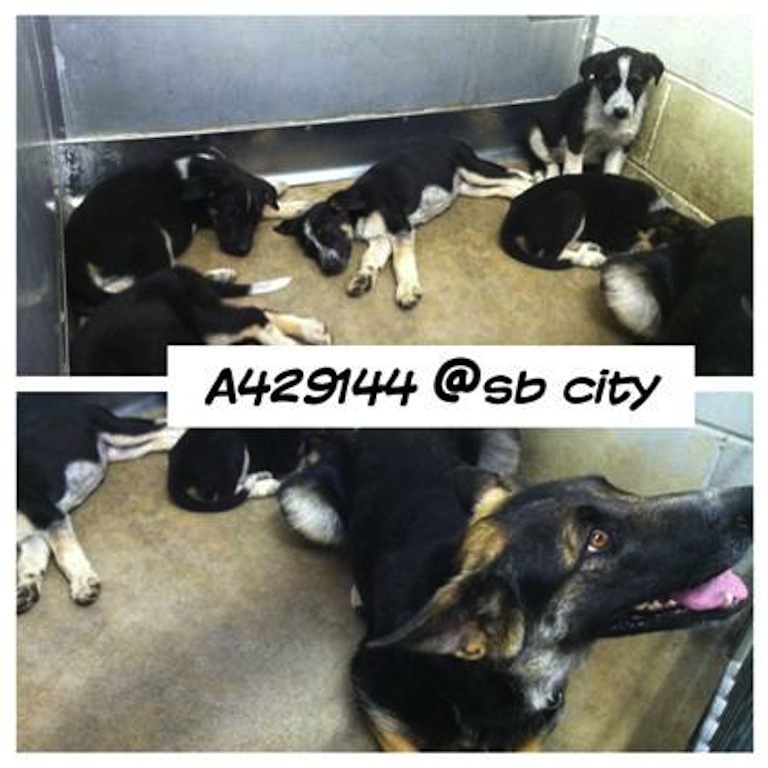 A young female german shepherd with her seven puppies was there, and their time was up. No ID chip in her, no signs of any ownership but only the obvious signs that while she had been feeding and tending her puppies devotedly, she herself was starving. We were out of town and couldn't pull her or the pups ourselves, and at the time we had no means of keeping the pups. But the mom? Hmmm, the wheels turned. Read the story of what happened, and see the photos here! We have been so busy that we forgot to update all of you on "Jerry" and the joy he feels and has brought to us. Despite all the beautiful photos you see on this website, we're notoriously bad about taking the camera or videocamera with us in our own spare time or at home. But here are a couple of photos snapped with our cell phones, pretty much regular happy sights for us. Jerry riding in the back of Brayton's SUV, smiling big as always. (Our husky girl Piper is behind him and long-haired shepherd Ford too; our little terrier gal Tilly is sitting in front.) He has this thing for cars and especially trucks. Really. He LOVES them all. And the second photo is the standard view at dinner time. 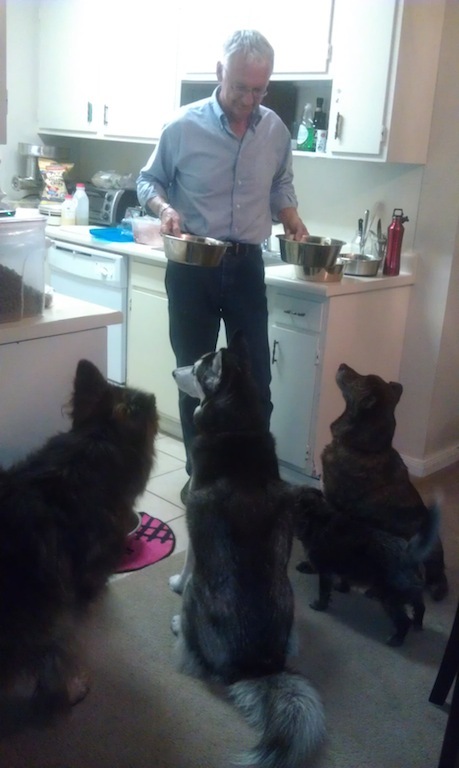 Four very alert eager canines, waiting patiently because their bowls get put down in specific places in specific orders, and they honor that. And then they eat their yummy (to them, anyway) organic raw ground chicken, goat milk, egg, and Missing Link supplement. All raw and all delicious, they think. Sure does wonders for their health, we'll attest to that anytime. Jerry has a perfect and forever place in our pack, thank you Universe! The season for whale sharks in the Gulf of Mexico has begun! Finding them was our highest priority after returning from finding and flying for whales and sea turtles off of Cape Cod, and biologists from Louisiana and Mississippi were more than ready for us to to find them so that they could fit them with satellite tags. Tropical Storm Debby had just passed, and the previous week's wild seas had calmed to near glass, so we wasted no time. The only problem was, unlike previous summers, there have been no sightings reported by fishermen or oil platform workers. Not a one. So where would we start the search? Trying to be as scientific about this as possible, we combined all of our sightings from the past two years with the biologists' data on locations of sightings in the past ten years, and from them we made a "statistically optimum" flight path. That path took us first to the Ewing Bank area, about 160 miles south-southwest of New Orleans, then eastward along the shelf about 75 miles, northeastward almost to Sackett Bank, then back to the Mars and Ursa platforms to catch up with some of the biologists who were there working with tuna, to tell them of our findings -- and very excitedly, as we had lots to report! Near Ewing Bank a pod of about 35 dolphins, then ten whale sharks all in close proximity, and later, about 50 miles eastward, ten short-finned pilot whales including several mother-calf pairs! We also saw two large manta rays on our way back to shore. See lots more photos and videos and read the full article here! Searching for the whale "Dome"
With Tropical Storm Debby threatening our return flight to New Orleans, we were pretty sure this might have to be our last day to fly the Gulf of Maine, or we'd be staying here for the week (which would have been great, but not for our own critters and obligations back in the Gulf of Mexico!). Still, we couldn't justify the cost just to fly out there and take more cool photos. Until the phone call came -- this time a well-known and loved female humpback "Dome" was photographed with fishing gear and netting all over her, and an orange buoy hanging off her side. Rescue boats and crews were mobilized, but they could not find her; could we go help? Of course! But most of the office staff had already left early for weekend whale-watching duties. We needed a good spotter. It was as if the whales knew they had a very special spectator. The boys (I assume?) were showing off like crazy! Back breaches, side breaches, fin- and tail-slapping, you name it, they were doing it. Even the finback whales seemed to be in finest form today. All of that would have made my day, but we weren't there to photograph the show. We couldn't even take the time to circle twice to catch another breach. As soon as we determined that the whales we were looking at were free of fishing gear, we moved on to the next sighting. Read the article and enjoy all the photos here! Bad weather kept us (and many sailors and fishermen) out of the air and off the water yesterday. This morning we didn't plan to fly until later in the afternoon -- but we received an unexpected satellite phone call from the hearty scientists who had been at sea all week, saying that a search was on for at least one leatherback sea turtle who was badly entangled with fishing gear, and could we help? Of course we could, and would, and did! With all the fishermen of all types out there east of the cape, in that small area that was teeming with whales, basking sharks, sea turtles, and other plankton and small-fish eaters, it was a wonder everybody wasn't getting tangled up! So we called and woke up our best spotters, grabbed the cameras we happened to have with us, and sped to the airport. Within 1.5 hours, we had made seven sightings of leatherback sea turtles in the general area of the turtle that had been reported as entangled and in distress. Only one of the animals we saw was obviously dragging some gear in its wake and moving in an impaired manner -- this was the turtle at the position of waypoint #0313 (N41 37.958 W69 43.057). Read the article and see many more photos here! Today we had some special passengers from the International Fund for Animal Welfare (IFAW) with us. We took them out to see the humpback whales, and they were not disappointed! We also flew over the beautiful IFAW sailboat called "Song of the Whale" which was here this week from its usual base in London, England. Folks on that boat have been out in the Gulf of Maine supporting other scientists in their whale-tagging efforts. Here are a few of our favorite photos from today -- all courtesy of IFAW. Note the two pairs of moms and calves, the open mouth in the bubble-feeding photo, and the energetic fella who gave us quite a show with all of his backdives and fin-slapping! Read the article and see many more photos and videos here! We've got whales! The humpbacks are definitely hanging out here in the waters 15-20 miles east of Chatham, MA. And the finbacks and minkes and basking sharks are discovering the goods, too. Today we witnessed much "bubble feeding" and with more of a community concerted effort than we've ever seen! Groups of 10-12 humpback wheels all working together, diving, driving the fish upward, and then gorging themselves. And the birds know where it's all happening. They practically dive right into the open mouths of the whales. It's just an awesome sight. Here's a photo of a basking shark, and one of the huge family of humpback whales bubble feeding. Read the article and see the photos and videos here! Today we found where all the humpback whales have been! Not in the Stellwagen Bank sanctuary this week, but southeast of it a few tens of miles, about 20 miles east of Chatham, MA. And they are there in massive numbers, we counted easily a hundred in an area of 10-20 square miles. Finbacks and minkes, too! Today's flight was not very long, as weather was moving in on us fast. But it was enough for us to see some fantastic bubble-feeding, some mom-and-calf pairs, to assist some scientists trying to put GPS satellite tags on some whales and other scientists searching for a whale reportedly entangled in fishing gear. A big day for a short flight! Our videos didn't come out as well as we'd hoped, but we're working on them. But here are some pretty good photos of what were outstandingly beautiful sights. Enjoy! First, here's the map of where we were. And you can download our GPS flight tracks on this website's main menu item "Flight Tracks." Stay tuned for the days five through nine. Now that we discovered where all the whales were, we were on them every day! UPDATE - NEW VIDEO ADDED (Jul 13) of finback and humpback whales June 17! Here is the official summary of the U.S. Coast Guard's investigation into inquiries about foam seen in the waters off Venice, LA following a planned dispersant spraying exercise by MSRC (Marine Spill Response Corportation) out of Kiln, MS at Stennis Airport (KHSA). MSRC planned and claims to have used water as a mock dispersant for this exercise, scheduled for and carried out on June 13, 2012. 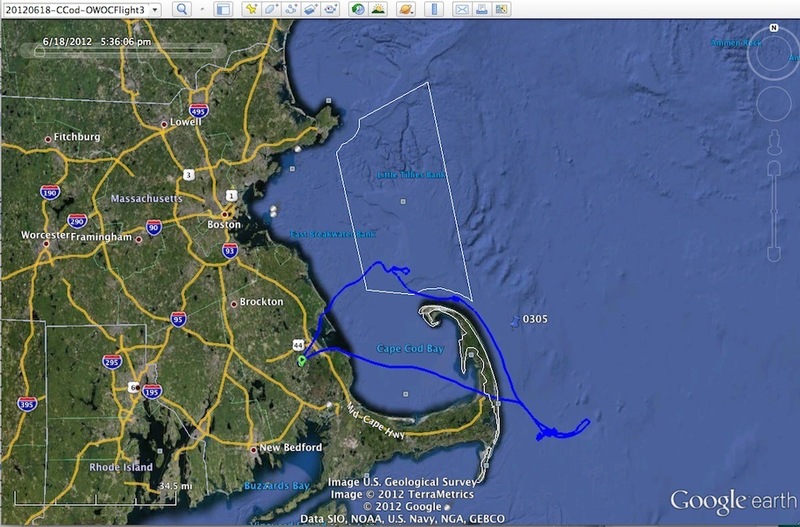 The original plan submitted by MSRC to the USCG can be downloaded asa pdf file here, under this website's main menu item "Flight Tracks" and titled "20120613-USCG Investigation of MSRC Dispersant Spraying Exercise." Here is the official letter from the USCG to Billy Nungesser, President of Plaquemines Parish, who requested the investigation. Thanks to the USCG for sharing this with us! Read the letter, attachments, and more about this investigation and spraying exercise here. Today we investigated a reported rig fire at an Energy XXI platform just 20 miles south of Louisiana, as well as the site of chronic pipeline leakage from a Taylor Energy platform damaged by Hurricane Ivan in 2004, and several other reported and newly-found oil slicks east of Venice, LA. Here are a few photos highlighting some of the sights today. Read the full article and see other photos and several videos here! 2012 May - From Empty Nest to Love Fest! The last "Extremely Urgent" plea came across the internet from our rescuer friends who were busy pulling dogs out of the terribly-high-kill shelter in Devore, San Bernardino County, CA. 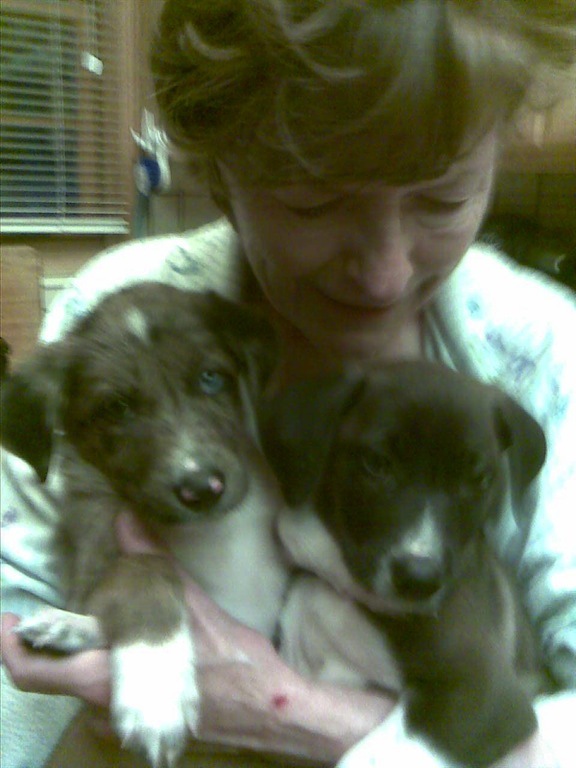 Five pups, looked like mixes of australian shepherd and cattle dog. No mom, and the pups were small, no history, the shelter said they had no information on them. I had just landed our single-engine plane on the small Caribbean island of Dominica. What could I do from there? Probably nothing, why was I even looking at these emails now? But my subconscious had something else in mind. It kept saying "Montie and Sallie!" They are a wonderful dog-adoring couple who live in a large home on a large forested picturesque lot on the outskirts of beautiful Big Bear City, CA, high in the San Bernardino Mountains. (Yes, it really IS paradise there!) They have fostered some rescue dogs for us now and then during the past few years, and they were starting to talk about being ready to adopt another rescue dog or two. Their own very old golden lab-retriever Lucas was just about ready to pass away, and their sweet old eskimo dog Bob would also enjoy some more company. So I forwarded that email to them immediately, and back came their answer just as fast. YES! They were interested! 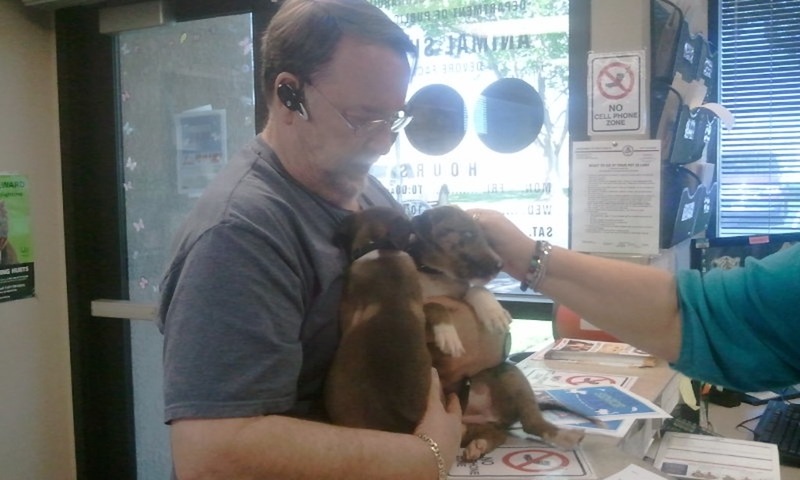 Not just interested, they said they would not take just two pups and risk leaving the other three to be euthanized. They would take all five and raise them until we could find great homes for three of them! (Do you love these people already or what?) OWOC stalwart ever-ready volunteers Lori and Dave made all of the arrangements, and Dave drove down to Devore from Kernville and Montie drove down from Big Bear early Sunday morning. As good fortune would have it, shortly after Montie and Dave arrived, some other folks arrived who wanted to adopt the pups, too. Dave judged them to be terrific adopters, so Montie took the two little gals who had approached him eagerly at the start, wrapped them inside his jacket, and Daddy's girls were on their way. Now this was already the stuff of a happy-ever-after perfect doggie rescue. But there was more to come! Read the whole story and see all the photos and video here! Today we flew to the Taylor Energy site, then the Macondo area, then southwestward toward Green Canyon as far as incoming convective weather permitted, then northward toward Grand Isle, and finally back to the Taylor Energy site before returning to New Orleans. Aboard our plane was Dr. Ian MacDonald from Florida State University. A team of scientists including two of Dr. MacDonald's students was on a boat launched from Venice, with the purpose of carefully collecting samples of the slick at the Taylor Energy site for later analysis. A second pilot and plane came along just to look at the Taylor Energy site and to help guide the boat to good sampling locations. We gave the boat crew one of our aviation handhelds to faciliate reliable communication with the aircraft, and the boat crew felt they had been quite successful in obtaining excellent samples for analysis. Thanks go to Dan Tonsmeire of Waterkeepers Alliance for arranging and finding funds to help cover the boat and second plane and its photographer John Wathen, and hopefully some of On Wings Of Care's expenses as well. We have documented the chronic oil leakage at the Taylor Energy site just 12 miles off the southeast coast of Louisiana numerous times in the past year. The former platform was damaged and sunk by Hurricane Ivan in 2004, taking with it the twisted remains of over 20 pipelines. To date, only five of those leaking pipelines have been plugged or repaired. Taylor Energy supposedly sold its holdings in this site in 2008 to Korean National Oil and Samsung, but somehow the signatures weren't obtained to complete the sale, so apparently Mrs. Taylor and her company remain responsible for this chronic pollution site. In recent months, an NRC report has been filed approximately every other day by some unidentified "aerial observation" which reports the observed extent of the surface slick at this location and provides an estimate of the volume of oil present. Strangely enough, while the surface area dimensions reported tend to be low but not terribly inconsistent with what we've observed, the volume estimates are absurdly low. The volume estimates imply an assumption for the average thickness of the visible sheen to be on the order of 4-40 nanometers. Yes, that's 4-40 thousandths of a micron, no more than 1/25th the diameter of a typical human hair. Whoever that unidentified aerial observer is must have high-resolution, powerful multiband spectrometers for eyes, to see and quantify a sheen so thin! 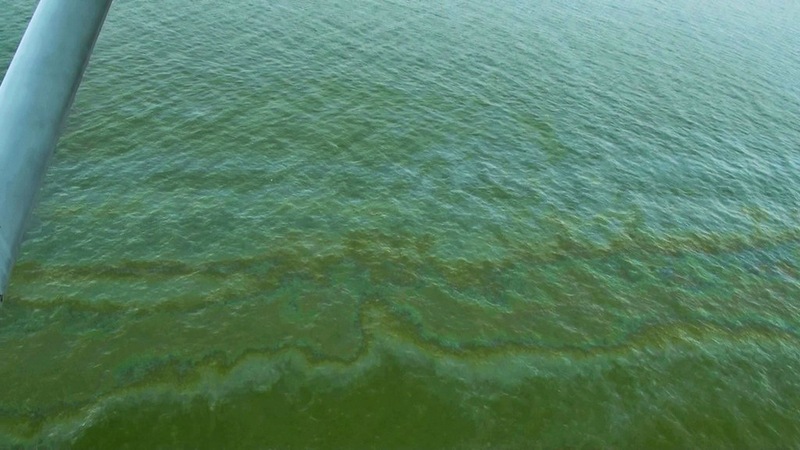 So why are they chronically under-reporting the volume of this long-standing, very ugly, oil pollution incident? Is someone duping Mrs. Taylor? Or is Mrs. Taylor duping the US Coast Guard? We have been asking questions of the USCG in Morgan City, and we hope to learn more in the coming week. One thing there is no disputing: this chronic, egregious pollution has gone on far too long. Read the full article with photos and videos here! 2012 Mar 12 - Flying Goats! 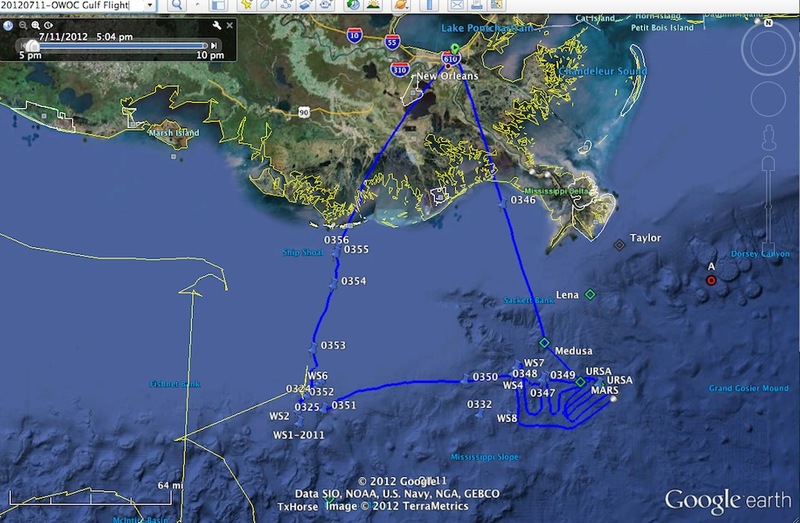 2012 Feb 29 - OWOC Gulf Flight - Taylor & Macondo - Fresh oil still! Jeremiah comes back home to us! 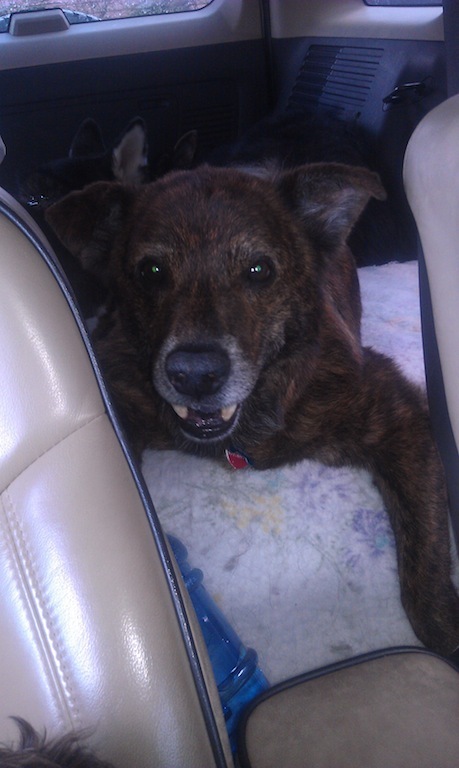 2012 January 01 - CHAMP found his way to the airport and stayed! 2011 December 31 - Mississippi Goats Still Rock! Our Gift for YOU for 2011! Abby & Dinozo -- Two of a Kind!